The police called Sarel to catch a snake, but ended up putting his life in danger after refusing to get out of the car. Snake catcher Sarel van der Merwe bagged three green mambas in one day last Friday. 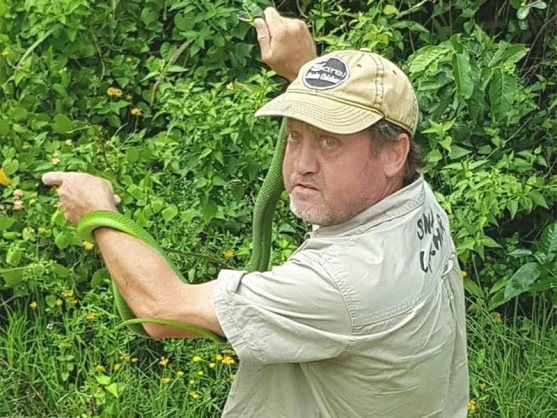 NATIONAL NEWS - Intrepid KwaZulu-Natal snake catcher Sarel van der Merwe was recently put in a spot bother when he was called out to attend to a green mamba sighted in a tree in Bhoboyi. Sarel received the call for help from the Saps control room in Port Shepstone on Saturday morning, February 2, reports South Coast Herald. Two constables escorted him to the area in Bhoboyi where the green mamba had been spotted. When they got to the area, the constables didn’t get out of the vehicle, leaving Sarel to walk some 10 minutes to the where the snake was in a tree. Once in the tree, Sarel quickly grabbed the snake, at which time the community began to stone the snake and him. The snake dropped to the ground, and a crowd of 100 people armed with pangas and knobkerries killed the snake. “It was a very tense situation and I am very disappointed by the ‘no help’ attitude from the police,” he said. Sarel said even when he was following the police to the scene, the two constables drove very slowly, taking their time to get there. He says the policemen must have heard the crowd screaming and shouting while sitting in their van and yet made no move to assist. Sarel says the police called him to catch the snake, yet they ended up putting his life in danger. No response was received from the police.